Not to bum you out, but when setting up loans in Quicken 2012, your principal-interest breakdown will often be wrong. You may calculate interest expense as $544.55 when your bank calculates it as $544.56. A few pennies here, a few pennies there, and pretty soon, your account balance and interest expense tallies are a few pennies off. You can try calling the bank, telling whomever you talk to what a bozo he (or she) is, and then demanding that someone there correct your balance. Display the register for the liability. To get to this account’s register, you just click the account name on the Accounts bar. Click the Account Actions button and choose the Update Balance command. (Go ahead. Tap your keys very hard if you’re angry that the bank won’t adjust its records.) 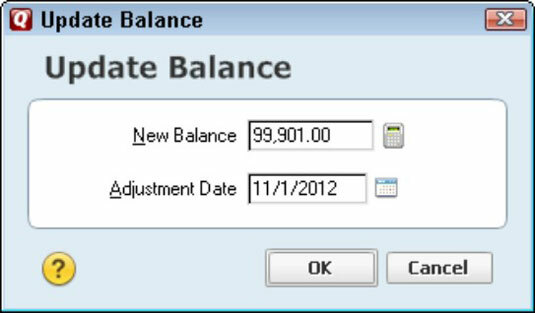 Quicken displays the Update Balance dialog box. Enter the correct account balance (that is, the one that the bank says is correct). Enter the last day of the month or year for which you’re making the adjustment. When the Update Account Balance dialog box correctly describes the needed adjustment, click OK.